Licensed Bankers are rather different from normal bankers as these bankers are involved in selling investment products such as securities. 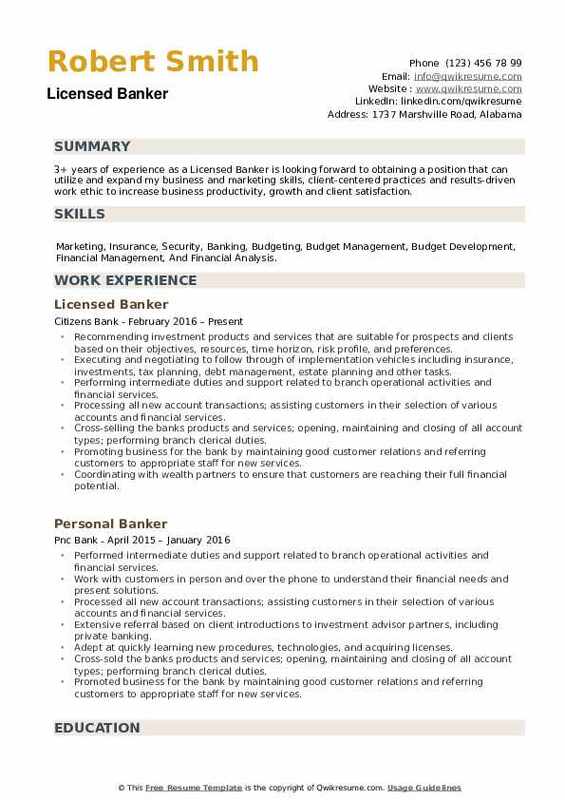 The major roles and responsibilities that can be seen on most of the Licensed Banker Resume include – building strong customer relationships, identifying the investment needs of the customers, recommending appropriate investment product, providing financial planning service, assisting customers in targeting their financial goals, generate revenue to the bank by selling their respective products and services and take responsibility of sourcing and bringing new leads. The most sought-after qualifications for this role include – very good knowledge of financial products, computer literacy, customer service orientation, financial experience, sales skills, outgoing and intuitive attitude, and strong networking abilities. Employers pick those resumes that can display a Bachelor’s degree in Finance or Accounting. Special License such as FINRA license is required. Summary : Energetic and friendly professional with 9 years experience as a Licensed Banker in the financial industry who is always looking to enhance and expand skills. I can be a perfect fit for this position with my flexible schedule, passion for helping others, and my business sense acquired from helping a diverse customer base. 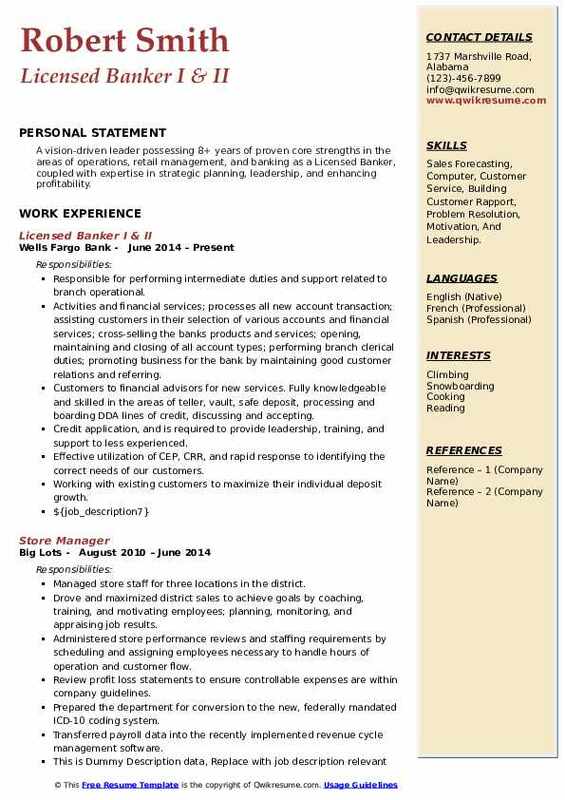 Skills : Excel, Microsoft Office, PowerPoint, Word, Sales Forecasting, Computer, Customer Service, Building Customer Rapport, Problem Resolution, Motivation, And Leadership. Functioned as a central point of contact while assisting clients with various accounts and financial services, ensuring all their personal, trust, estate, and business banking needs were met. Cultivated new and prospective client relationships, while maintaining long-term clients. Educated and informed clients about products and policies; increasing customer satisfaction. Assisted customers with credit card, auto loan and home equity loan applications and closings. Worked closely with a mortgage banker to assist clients with document preparation and appointment scheduling for mortgages and refinances. As a business specialist, I assisted clients in opening business accounts, credit lines, as well as setting up a point of sale systems. Referring clients to an affiliated payroll and regulatory compliance specialist. Discussed planning for retirement and education savings; referring clients to the partnered financial advisor for investing and financial analysis. Handled managerial duties including transaction approvals and addressing customer concerns. Provided information for credit monitoring, identity protection and help victims of identity theft. Objective : 3+ years of experience as a Licensed Banker is seeking to obtain a position with an industry leader that would utilize my strong sales experience and, in doing so acquire valuable knowledge. Skills : MS Office Products (Word, Excel, Access, PowerPoint, And Publisher), Adobe, QuickBooks, Legacy, Client Central, MARS, Along With Multiple Payroll And Timekeeping Software Systems, Such As UltiPro And Deltek. Successfully collaborated with colleagues and worked as part of a team to achieve business results. Managing their complete banking relationship across the company, utilizing a proactive and disciplined approach to generate growth in their balances. Acquiring new clients by actively soliciting referrals and developing internal and external sources. Adding value to the relationship by sharing the value of chase private client with clients that may be eligible. Actively managing their banking relationship through an advice-based approach and ensuring each client receives the best products, services for his or her needs. Partnering with specialists (private client advisors, mortgage bankers, and business relationship managers), to connect customers to experts who can help them with specialized financial needs. Headline : 7+ years of experience as a Licensed Banker is looking to utilize my proven skills and track record in the financial industry to help customers succeed in their retirement and financial goals. 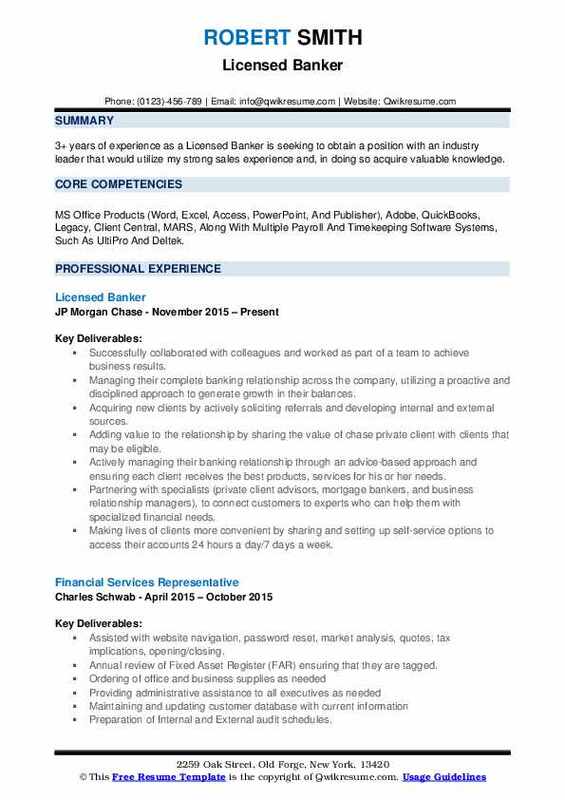 Skills : MS Word, Excel, Minitab, Sales, Client Relations, CRM, Ambitious, And Access - Excellent Computer Mac And PC. Able to articulate details of JP Morgan suite of investment and banking products and services. Assisting clients with financial planning based upon their individual investment objectives. Profiling clients and interpret financial information in order to discover opportunity and needs. Opening and actively managing brokerage accounts consisting of mutual funds, annuities, and life insurance products up to $3 million. Customizing timelines on a per client basis to set goals and deadlines for both consumer and business banking clients. Helping business clients establish the business, budget plan, project growth, increase profitability, and become more efficient. Developing excellent presentation skills through training and daily client interactions. Recognizing nationally by JPMorgan chase for providing excellent customer service. 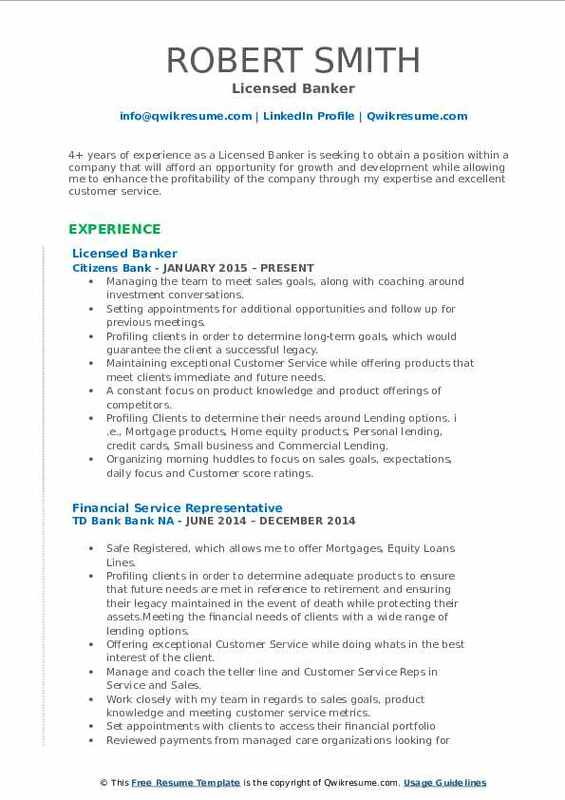 Objective : 4+ years of experience as a Licensed Banker is seeking to obtain a position within a company that will afford an opportunity for growth and development while allowing me to enhance the profitability of the company through my expertise and excellent customer service. 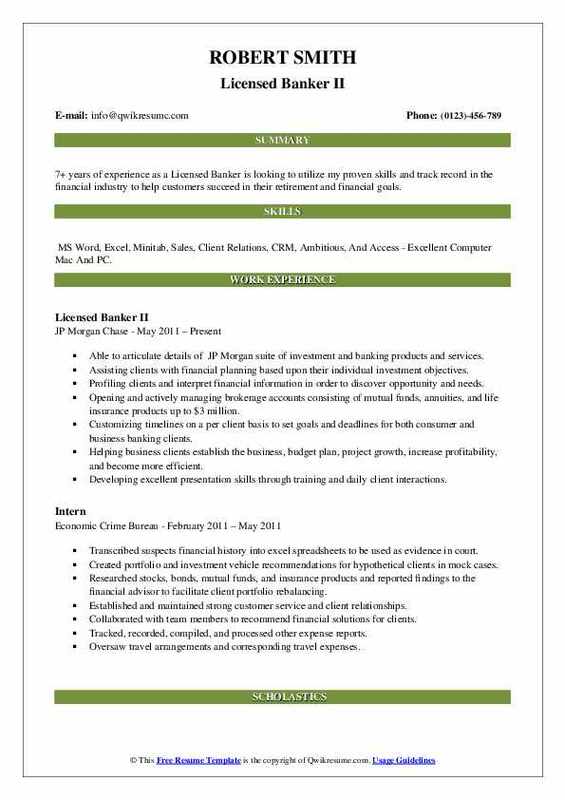 Skills : Excel, Fast Learner., Microsoft Word, Organization, CRM, Adobe, Lotus Notes, Net Query, And Chanel Link. Managing the team to meet sales goals, along with coaching around investment conversations. Setting appointments for additional opportunities and follow up for previous meetings. Profiling clients in order to determine long-term goals, which would guarantee the client a successful legacy. Maintaining exceptional Customer Service while offering products that meet clients immediate and future needs. A constant focus on product knowledge and product offerings of competitors. Profiling Clients to determine their needs around Lending options. i .e., Mortgage products, Home equity products, Personal lending, credit cards, Small business and Commercial Lending. Organizing morning huddles to focus on sales goals, expectations, daily focus and Customer score ratings. Objective : Accomplished Licensed Banker with 2 years of experience, consistently exceeds sales expectations, while providing the utmost care in client relations. Skills : Goal- Oriented, Strong Team-builder, Fluent In Spanish, Analytical Approachable, Cash Handling, Expertise Team Playe,r Proficient In MS Office/Excel, And Flexible Sales Professional. Increased new bank relationships within the local community; increasing the branches deposit levels by 18 million YTD. Consistently performed above expectations finishing each quarter in the top 10% of the region. Received platinum level customer service scores of 96% (q3 2015), 95% (q2 2015). Assisted the branch manager with the development of investment sales, acquisition plans, and strategies to increase overall. Revenue reaching 1. 2 million in sales (q3 2015) and 1. 5 million in sales (q2 2015). Helped train and develop new colleagues entering into various positions; while coaching towards the affluent segment. Headline : Dedicated and Hardworking Professional with vast Legal experience as a Licensed Banker and 5+ years of proven ability in the field; executing duties with the utmost professionalism in a timely and accurate manner. 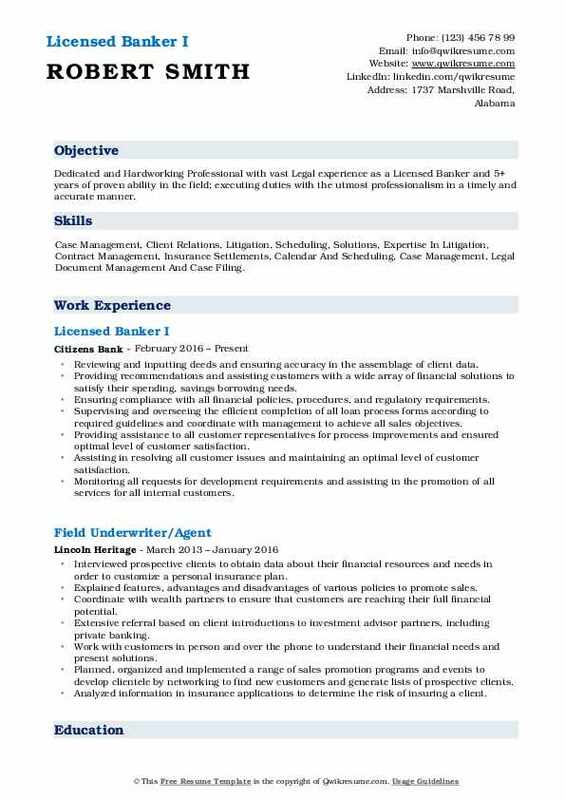 Skills : Case Management, Client Relations, Litigation, Scheduling, Solutions, Expertise In Litigation, Contract Management, Insurance Settlements, Calendar And Scheduling, Case Management, Legal Document Management And Case Filing. Reviewing and inputting deeds and ensuring accuracy in the assemblage of client data. Providing recommendations and assisting customers with a wide array of financial solutions to satisfy their spending, savings borrowing needs. Ensuring compliance with all financial policies, procedures, and regulatory requirements. Supervising and overseeing the efficient completion of all loan process forms according to required guidelines and coordinate with management to achieve all sales objectives. Providing assistance to all customer representatives for process improvements and ensured optimal level of customer satisfaction. Assisting in resolving all customer issues and maintaining an optimal level of customer satisfaction. Monitoring all requests for development requirements and assisting in the promotion of all services for all internal customers. 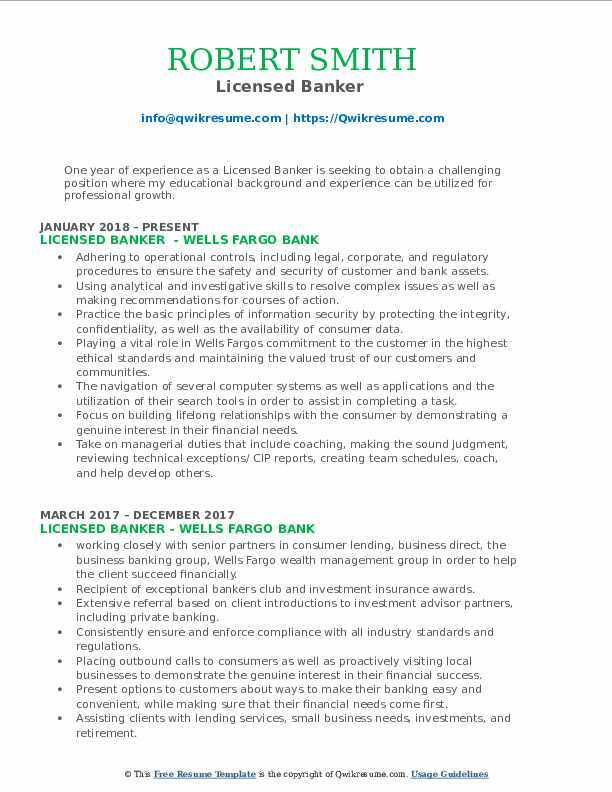 Objective : One year of experience as a Licensed Banker is seeking to obtain a challenging position where my educational background and experience can be utilized for professional growth. 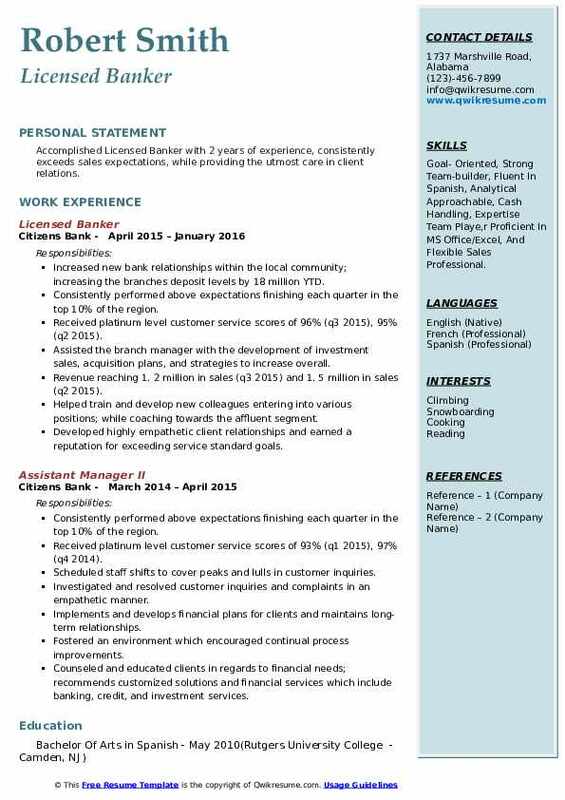 Skills : Access, Excel, Powerpoint, Storage Management, Proficient In MS Office Products, Program Installations And Configurations, File, Memory And Storage Management, Control Of Peripheral Devices, As Well As The Identification Of Exposures And System Vulnerabilities, Word, Excel, Access, PowerPoint, CloudCords, SVP, And SVT. Adhering to operational controls, including legal, corporate, and regulatory procedures to ensure the safety and security of customer and bank assets. Using analytical and investigative skills to resolve complex issues as well as making recommendations for courses of action. Practice the basic principles of information security by protecting the integrity, confidentiality, as well as the availability of consumer data. Playing a vital role in Wells Fargo's commitment to the customer in the highest ethical standards and maintaining the valued trust of our customers and communities. The navigation of several computer systems as well as applications and the utilization of their search tools in order to assist in completing a task. Focus on building lifelong relationships with the consumer by demonstrating a genuine interest in their financial needs. Take on managerial duties that include coaching, making the sound judgment, reviewing technical exceptions/ CIP reports, creating team schedules, coach, and help develop others. Objective : More than 7 years of experience as a Licensed Banker in Business Management, Client Development, and Management, with proven success in increasing revenue and profitability. Adept at assessing needs and priorities, and thrives in competitive and challenging environments. Goal drove, diplomatic, resilient, personable and persuasive, with an ability to build instant rapport with clients. 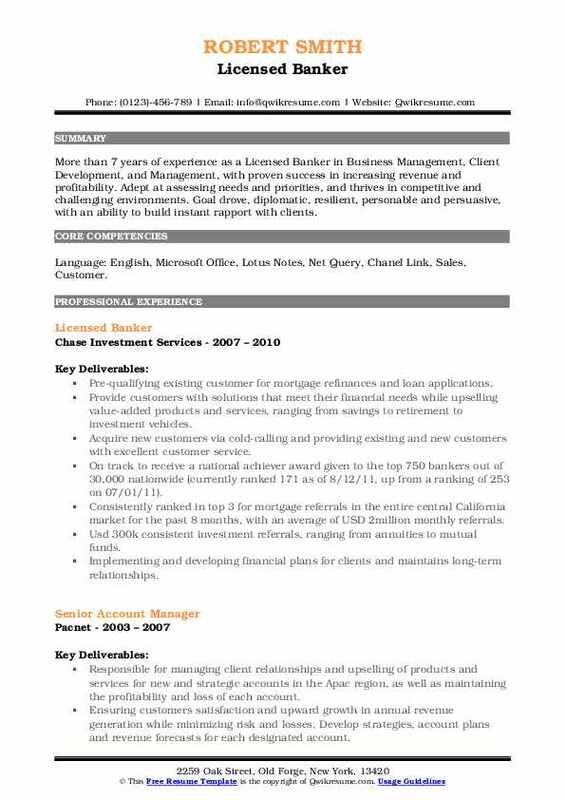 Skills : Language: English, Microsoft Office, Lotus Notes, Net Query, Chanel Link, Sales, Customer. Pre-qualifying existing customer for mortgage refinances and loan applications. Provide customers with solutions that meet their financial needs while upselling value-added products and services, ranging from savings to retirement to investment vehicles. Acquire new customers via cold-calling and providing existing and new customers with excellent customer service. On track to receive a national achiever award given to the top 750 bankers out of 30,000 nationwide (currently ranked 171 as of 8/12/11, up from a ranking of 253 on 07/01/11). Consistently ranked in top 3 for mortgage referrals in the entire central California market for the past 8 months, with an average of USD 2million monthly referrals. Usd 300k consistent investment referrals, ranging from annuities to mutual funds. Implementing and developing financial plans for clients and maintains long-term relationships. Summary : A vision-driven leader possessing 8+ years of proven core strengths in the areas of operations, retail management, and banking as a Licensed Banker, coupled with expertise in strategic planning, leadership, and enhancing profitability. Skills : Sales Forecasting, Computer, Customer Service, Building Customer Rapport, Problem Resolution, Motivation, And Leadership. Responsible for performing intermediate duties and support related to branch operational. Activities and financial services; processes all new account transaction; assisting customers in their selection of various accounts and financial services; cross-selling the banks' products and services; opening, maintaining and closing of all account types; performing branch clerical duties; promoting business for the bank by maintaining good customer relations and referring. Customers to financial advisors for new services. Fully knowledgeable and skilled in the areas of teller, vault, safe deposit, processing and boarding DDA lines of credit, discussing and accepting. Credit application, and is required to provide leadership, training, and support to less experienced. Effective utilization of CEP, CRR, and rapid response to identifying the correct needs of our customers. Working with existing customers to maximize their individual deposit growth. 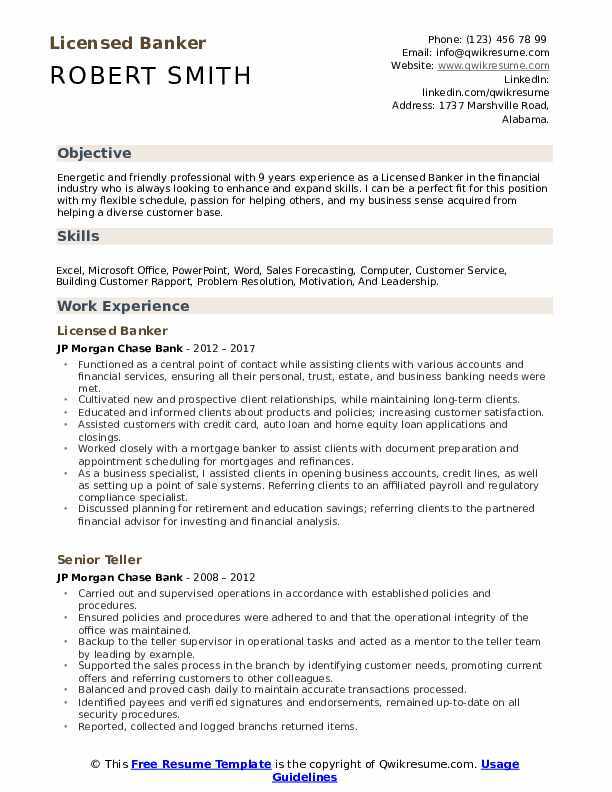 Objective : 3+ years of experience as a Licensed Banker is looking forward to obtaining a position that can utilize and expand my business and marketing skills, client-centered practices and results-driven work ethic to increase business productivity, growth and client satisfaction. Skills : Marketing, Insurance, Security, Banking, Budgeting, Budget Management, Budget Development, Financial Management, And Financial Analysis. Recommending investment products and services that are suitable for prospects and clients based on their objectives, resources, time horizon, risk profile, and preferences. Executing and negotiating to follow through of implementation vehicles including insurance, investments, tax planning, debt management, estate planning and other tasks. Performing intermediate duties and support related to branch operational activities and financial services. Processing all new account transactions; assisting customers in their selection of various accounts and financial services. Cross-selling the banks' products and services; opening, maintaining and closing of all account types; performing branch clerical duties. Promoting business for the bank by maintaining good customer relations and referring customers to appropriate staff for new services. Coordinating with wealth partners to ensure that customers are reaching their full financial potential. Representing the customer to wealth partners prior to meetings with the customers so that they are prepared to meet with the customers.